preheat oven to 400 degrees F. Place the beets in a small roasting pan and pour in enough cold water to reach about one quarter of the way up the sides of the beets. 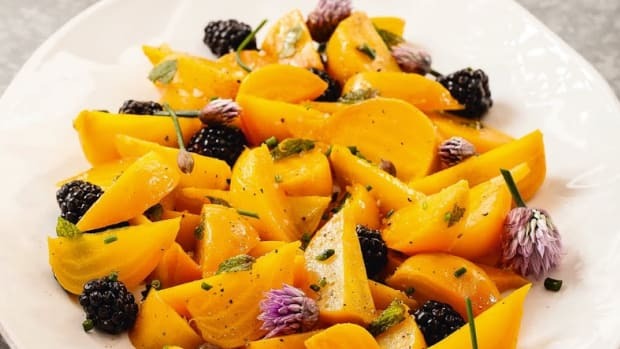 Roast the golden beets separate from the red beets in a separate pan so the colors do not bleed together. Cover the pan with foil, and roast the beets until they are tender, 2 hours - 2 hours and 15 minutes depending on their size. To check for doneness, gently insert a toothpick into a beet. The skewer should slide through easily. Remove the beets from the pan, cool and peel. Cut each beet into 1/4-inch-thick round slices. Cut each slice with a 2-3-inch round cookie cutter. (You will need ten rounds.) Cut trimmings into 1/4-inch dice and reserve 1/2 cup for garnish. In a sauté pan, bring ˝ cup of vinegar and ˝ cup sugar to a boil. Stir to combine and sugar is dissolved. Lower heat to a simmer and poach beets one minute per side. Poach the golden beets first separately from the red beets to prevent the beets bleeding onto one another. With a slotted spatula, remove and place on a baking tray lined with parchment paper. Cover and refrigerate until needed. Repeat with the red beats. Note: You can prepare this dish up to this point a day ahead. When ready to assemble, heat the olive oil in a small sauté pan. 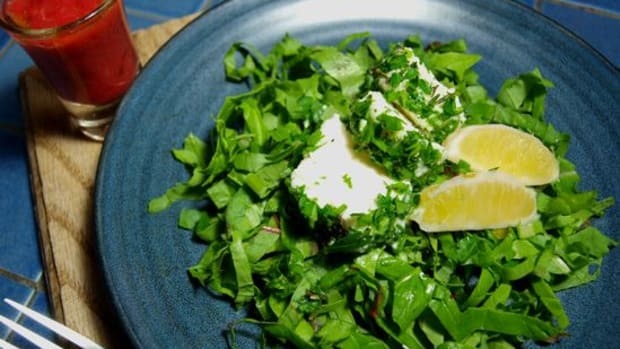 Arrange the slices of herbed Goat Cheese in the pan and warm slightly, turning them with a small spatula just to warm both sides. This has to be done quickly or the cheese will melt. Starting with a red beet round, place one round on a firm, flat surface and begin to layer. Top with a slice of goat cheese, then a golden beet round, a second slice of cheese, another red beet round, a third slice of cheese and a beet round. 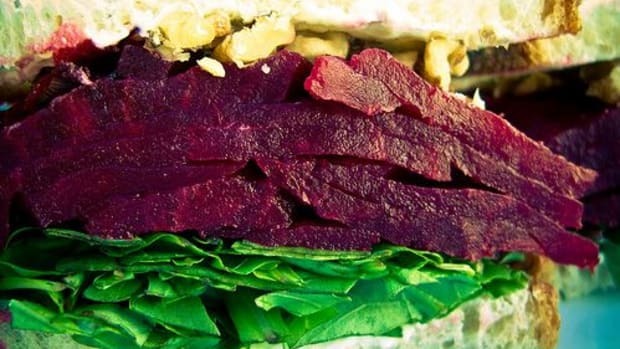 (Continue until you have five layers of beets and four layers of cheese.) 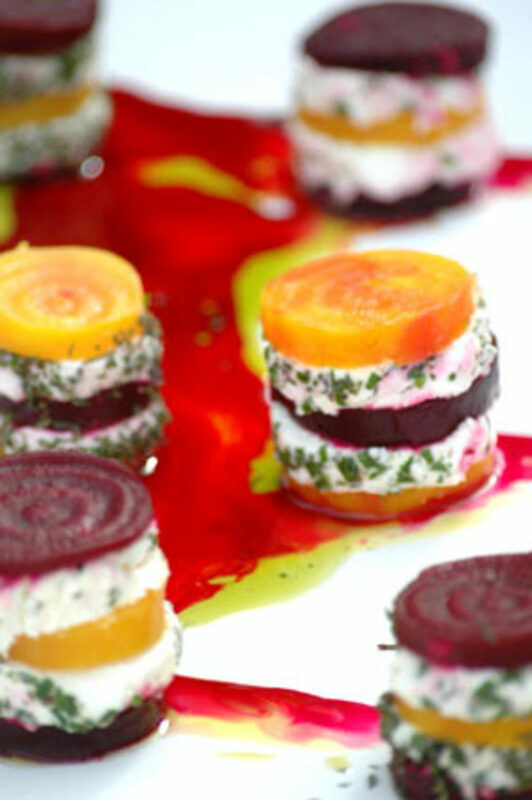 Depending on the size of the beets you purchased from the market, you can either leave the rounds whole or cut them in half, placing them on their back when plated so you can see the gorgeous alternating colors between the cheese. Repeat with the remaining beets and cheese. If you have white plates to serve this dish on, use them as it looks spectacular. Drizzle plates with Fresh Organic Basil Oil and Balsamic Glaze. Arrange the stacks of beets in the center of each plate with drizzled oil and glaze. Toss the baby lettuces with the Organic Blood Orange Almond Vinaigrette and mound half of the lettuces in the middle and in between the stacks of beats. Sprinkle reserved diced beets on top of greens. Serve immediately. 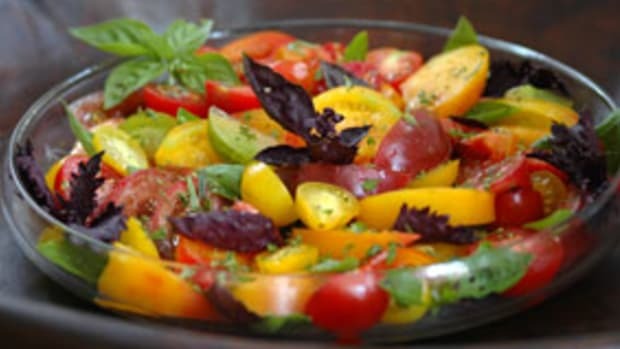 Chef&apos;s Tip: This is truly an impressive dish and fairly easy to do if prepared ahead. I have served this dish to people who do not like beets and they love it. My advice, don&apos;t tell your friends what they are eating until they have taken a bite. As always, use as many organic ingredients you can find for optimum flavor.